Clubs change their kits every year so that they can sell new jerseys to their supporters but the club colors always stay the same. 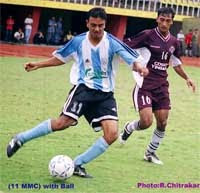 MMC was picked, because their Argentina style jersey is the most famous club jersey in Nepali football. 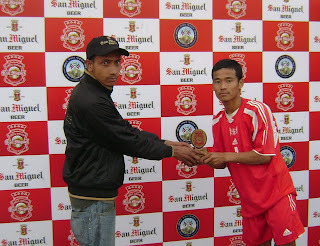 And yes it is a big deal - clubs need to stop treating football like "time pass". They need start marketing themselves, build a fan base, etc. If I am a MMC fan - what jersey do I wear to the stadium to support my club? What color does my blood bleed? True..ovb. a lota people are unaware bout that press conference where MMC unveiled their new jersey...if I am normal fan who by chance dropped in to a league game..I wouldn't even recognize MMC! !....I believe the jersey was changed to give Hyundai logo some better visibility and space!